In my family collection of ephemera, I have the following 8.5" by 11" piece of paper showing pieces of the Freeland family tree. This is one of my sources for my Freeland line that I wrote about in the last Surname Saturday post. Near the left, you can make out Helen Copeland, who is my grandmother (though Copeland is her married name). Note in the upper-right-hand corner, written sideways is "David Freeland came over in 1821 on ship David" which helped me find the immigration record that I noted in my Surname Saturday post. The reference under David Freeland's name to "Danish Vrealand 900" is fascinating in that it shows that there is a story that the line originated in Denmark (possible Vikings?). I'm not sure if I will be able to prove that, but it certainly is possible. Across the top is Scotland (border county), Ecclefechan, and Lochiel which refer to the fact that the Freelands were from Scotland, and possibly lived in different parts in different generations. 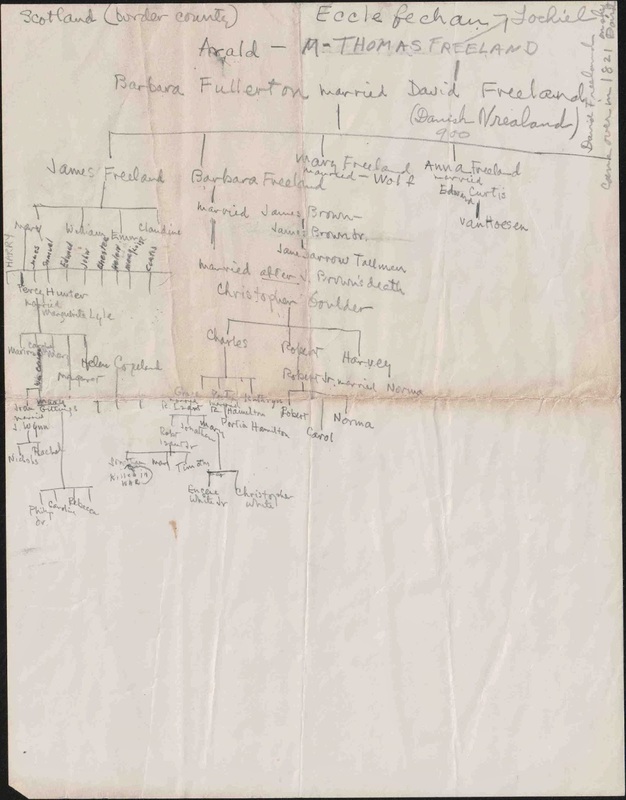 According to these notes on this piece of paper, David's father is Thomas Freeland, and his mother is Arald. His wife is named as Barbara Fullerton. In Donald Whyte's book, Dictionary of Scottish Emigrants to Canada before Confederation, the Freeland family group is followed by a few family groups of Fullertons. Of course these notes are also helpful in guiding me "forward" in time. James Freeland's sisters married, and therefore have different surnames in U.S. Census records (and other records). This tells me Barbara first married James Brown, then after his death, married Christopher Goulder. Sister Mary married Frederick Wolf. (Their household is where I found David Freeland in the 1860 U.S. Census.) And sister Anna married Edward Curtis. The horizontal line may mean that there are additional siblings; I will keep looking. I do want to note here that just to the left of the middle of the page is Portia Hamilton, third cousin of my grandmother. My mother stayed in touch with her over the years and when we married in 1991, we received a wedding present from Portia, my third cousin 2x removed. (She was elderly and died the following year.) I wonder if she or my grandmother had something to do with putting together this family tree.